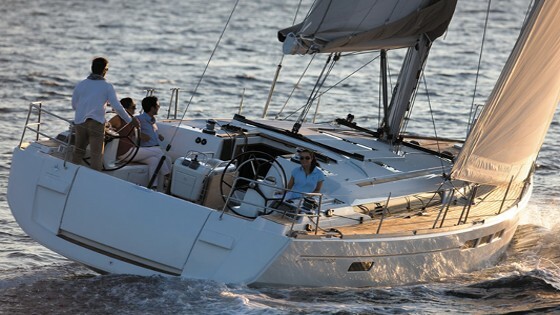 The all-new 2019 Jeanneau Sun Odyssey 410 includes innovative features in a perfectly-sized couple's boat. 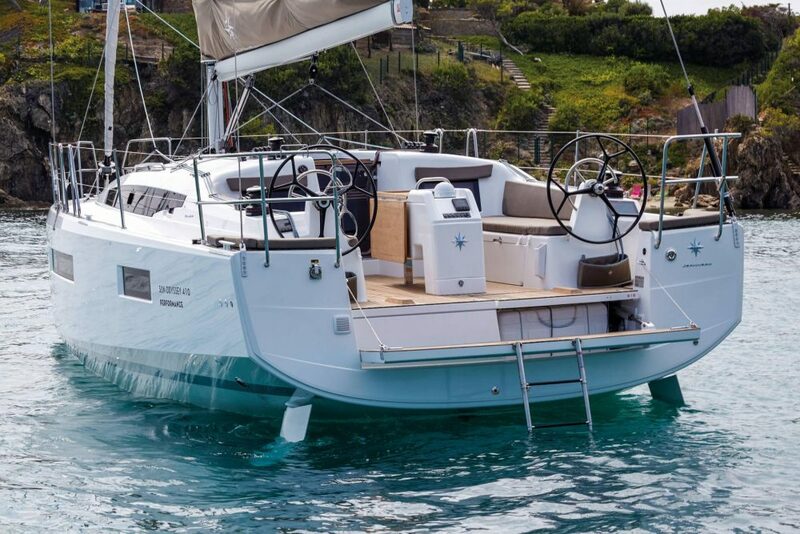 The 2019 Jeanneau Sun Odyssey 410 was unveiled at the 2018 Annapolis Boat Show with an enhanced design by Marc Lombard, which can be configured with two or three cabins and one or two heads. The 410 is powered by a 40 HP Yanmar, which can be upgraded to a 45 HP, and has twin wheels and a sloping deck—that means you never have to step over a cockpit coaming to get to the side decks. 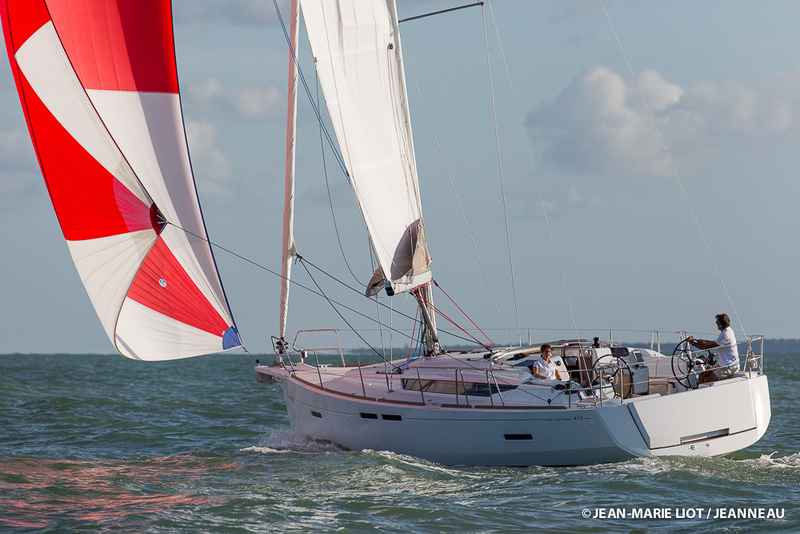 See 2019 Jeanneau Sun Odyssey 410 listings, or read our related reviews on the Jeanneau Sun Odyssey 490 or the Sun Odyssey 419. 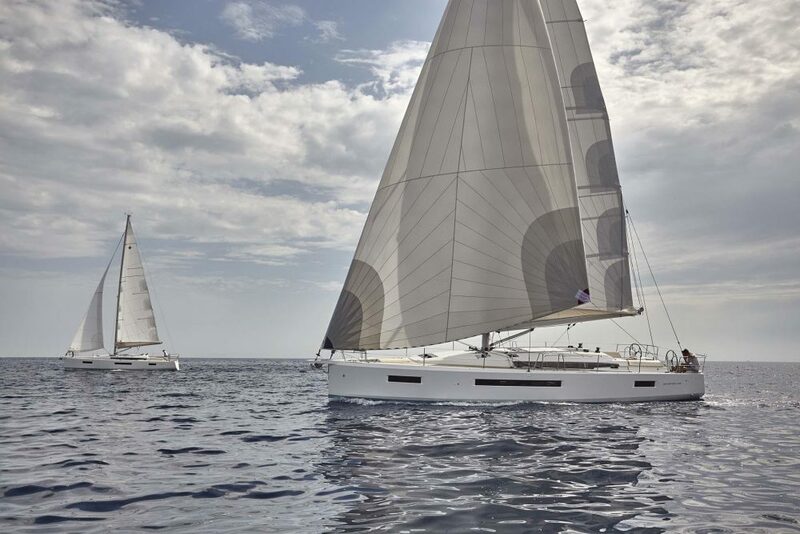 Last year Jeanneau turned sailboat deck layout on its ear with the introduction of their Sun Odyssey 490 and 440 and the concept of the “walk-around deck”. Now this funky design has made its way to their newly introduced 41-footer. 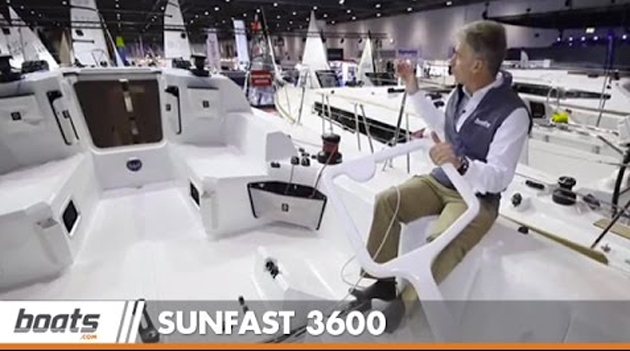 Unveiled at the Annapolis Boat Show, the Sun Odyssey 410 sports the same game-changing deck but thanks to designer Marc Lombard, this new model has a few more tricks both inside and out that snap your head around for a second look. 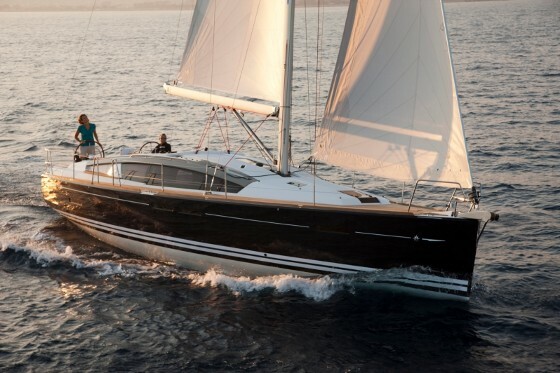 According to Jeanneau, the Lombard-designed, hard chine hull combined with a high aspect cathedral rig, ensure this boat delivers on its high performance aspirations. As a complement to the new-fangled deck, the 410’s hull has been changed up as well. A hard chine runs down low the length of the hull to help keep her on her feet in a blow and her maximum beam is brought all the way aft. Lombard added a “negative” bow which slopes aft at deck level and has a bit of rocker so it clears the water by a few inches. Not only does this make her look like a true racer, it’s designed to reduce drag when tacking in light winds. An optional integrated composite bowsprit adds functionality by pushing the anchor roller farther out and away from the stem and creating an attach point for a gennaker. It’s a good addition from an aesthetic standpoint as well. 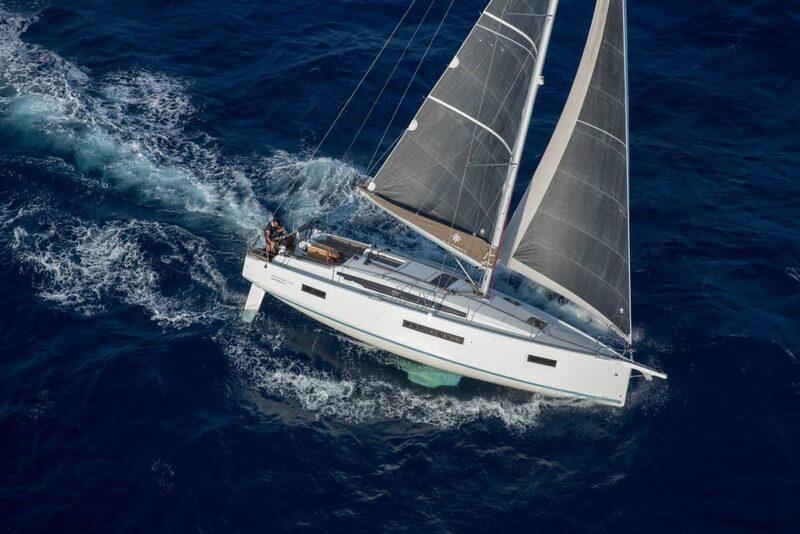 The standard rig includes a double-spreader Z-spar mast, a traditional hoist mainsail and a 115 percent genoa for a total of 865 square feet of sail area. 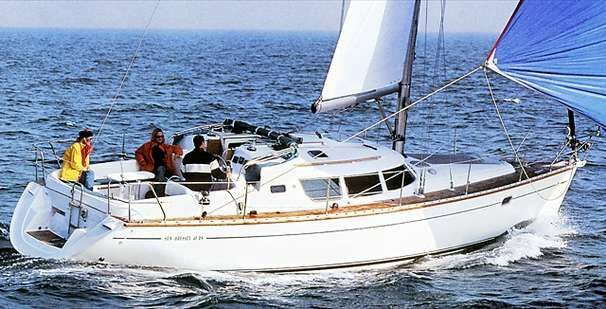 However, you can opt for in-mast furling and a self-tacking jib with a track just ahead of the mast for easy single-handing. There are no jib tracks on deck to stub your toes on due to the use of friction rings on the headsail sheets. The optional performance pack adds 11 inches to the mast, laminated sails, an adjustable textile backstay and composite wheels. With these additions you’re bound to look like a rock star on the club racing circuit. Unfortunately, our test would have made even the most lax club race seem boisterous as we hoisted sail on the flat waters of the Chesapeake in a breeze that occasionally gusted to nine knots. Undaunted by the weather, we managed to have fun and point high despite the fluky wind. At 35 degrees apparent wind angle, we managed to sail 5.2 knots in nine knots of true breeze. When we cracked off to 120 degrees, we still carried 3.7 knots of boat speed and then we came back up to five knots at 65 degrees. Under power, we tested out the retractable bow thruster that makes close quarters maneuvering easy. The 410 is powered by a 40 HP Yanmar common rail diesel and shaft drive with a three-blade fixed propeller, which are upgradable to a 45 HP engine and a Flexofold folding prop. With the smaller engine and standard prop, we motored at 6.2 knots at 2100 rpm and 7.9 knots at wide-open-throttle at 3100 rpm. The boat backed straight as an arrow but took about two boat lengths to turn, which may be where that bow thruster would come in handy. The 2019 Sun Odyssey 410 was named "Best Midsize Cruiser Over 38 Feet" by Cruising World. Like her two predecessors in the series, the 410 has twin wheels and a sloping deck that means you never have to step over a cockpit coaming to get to the side decks. Just walk from one wheel all the way to the bow and back to the other side with no obstacles. Older knees will appreciate this feature. Best of all, you sit and drive facing forward which is easier on the neck. Drains by the pedestals gather up any water that sprays up over the bow and rushes down toward the driver. Unlike the 440, the 410 doesn’t have a fold-out cockpit coaming so the Harken winches are outboard and just ahead of the wheels rather than inboard on pedestals. That makes them easier to reach for the driver but they’re not as well positioned as on the 440 where crew can stand behind them and grind while looking at the sail ahead. Although the 410’s coaming doesn’t expand into a lounge, the side decks are still the main attraction and worth the price of admission. 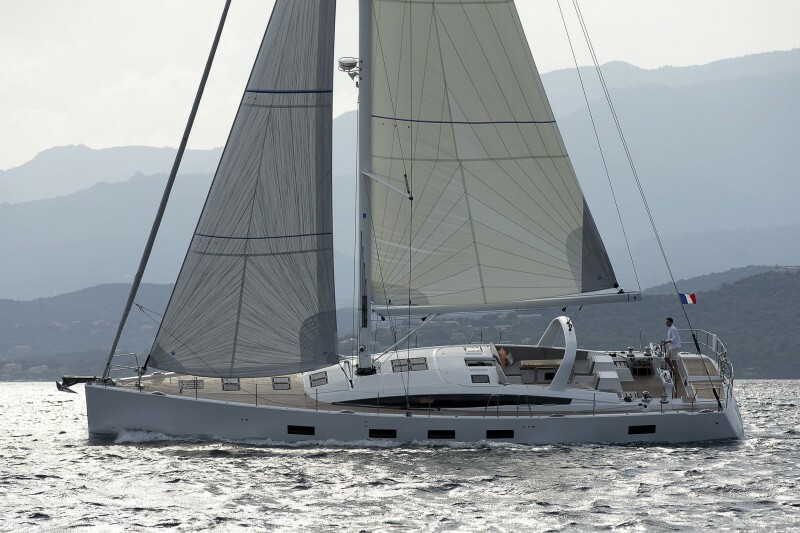 The 410’s interior is the work of Jean-Marc Piaton and can be configured with two or three cabins and one or two heads. The designer tucked in a few little gems including the “day bed” in the saloon. Positioned on the centerline just aft of the compression post, this versatile lounge does three things: It extends aft to add seating to the fold-out dinette, it forms an additional sea berth with stowage space below, and in its natural shortened state, it’s a cozy lounge for off-watch crew. The galley grew, muscling in on a bit of the saloon. Twin sinks, an Eno stove with dual burners and oven, and Vitrifrigo refrigeration are standard. An additional freezer drawer can be added to the aft port cabin, especially when it’s used as a utility room in the two-cabin version. A splash screen separates the galley from the forward-facing nav desk which isn’t as commodious as on the 490 but it’s nice to see the addition of a space dedicated to ship’s business. 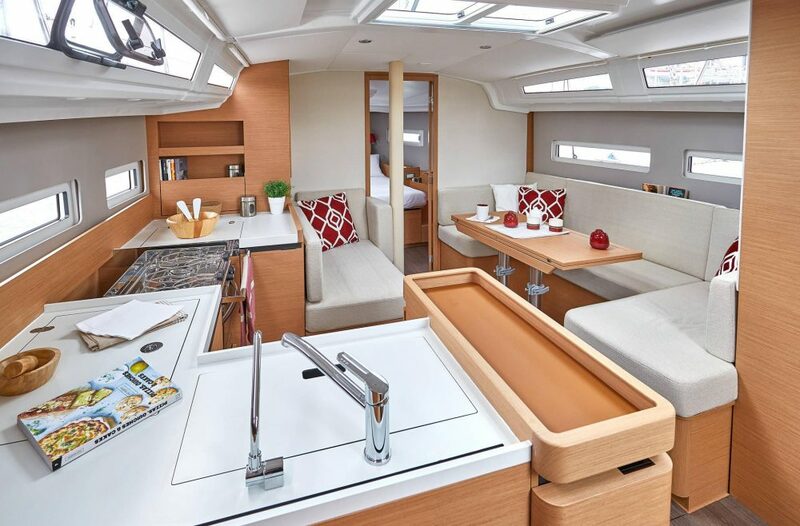 Like its predecessors, the Sun Odyssey 440 and 490, the 410 features a contemporary, central galley that is ultra-functional and with an abundance of storage. The master stateroom has a choice of bed configuration. It may be offset on the diagonal (to make room for an ensuite head) or on the centerline in case there’s only a single head aft. With the added head the space is a bit cramped and the shower stall is hardly worth it. In either case, the berth is square so household sheets can be fitted and there’s copious stowage throughout the stateroom. Digital switching is by Scheiber eliminates the need for a large electrical panel. The optional 7.5 kW Onan genset is tucked in behind the engine, which makes good use of space but working on it in case of a breakdown will not be fun. Water tankage is 87 gallons but a second 53-gallon tank may be added. In all, I’d opt for the two cabin, single head layout with added refrigeration in the utility room, which will come in handy for stowing all sorts of extra cruising gear. The interior finish is pure Jeanneau. Fabric-covered bulkhead panels provide some sound attenuation and the Alpi wood finish is available in either teak or grey cedar. Headroom in the galley is 6’ 3” and in the saloon 6’ 5” which is impressive. The French builder knows they’ve tapped into something special with their revolutionary deck layout and will be rolling it out on future models. It goes to show that even after building 18,000 similar yachts, there’s always room for innovation. But even as the new deck design proliferates throughout the Sun Odyssey offering, the company is still adding twists and incremental improvements. In all, the new Sun Odyssey 410 isn’t just another iteration in a smaller package. She’s a boat that will make you look twice and then maybe once more. 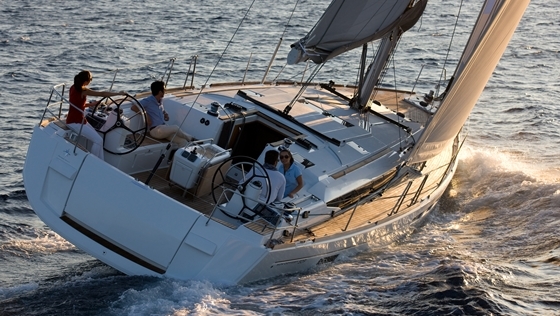 See 2019 Jeanneau Sun Odyssey 410 listings. Sail area 865 sq. ft.
Water capacity 87 + 53 gal.